Patil, Sameer Suryakant 2007. India's China Policy in the 1950s. South Asian Survey, Vol. 14, Issue. 2, p. 283. 1 See Maxwell, Neville, India's China War (London: Cape, Bombay: Jaico, 1970), pp. 221–224. 2 After a tour of the western sector in June 1962, General Kaul reported: “It is better for us to establish as many posts as we can in Ladakh, even though in penny packets, rather than wait for a substantial build-up, as I am convinced that the Chinese will not attack any of our positions even if they are relatively weaker than theirs.” This is quoted in Mankekar, D. R., The Guilty Men of 1962 (Bombay: Tulsi Shah Enterprises, 1968), p. 41. 3 Unpublished document. See above n. 1. 4 Unpublished document. See above n. 1. 5 Unpublished document. See above n. 1. 6 Our Credulity and Negligence (sponsored by Indians for Victory. Bombay: Ramdas G. Bhatkal, 1963), pp. 66–71. 7 India's Note to China, 10 September 1959 (Indian White Paper, No. II, pp. 8–10.) This note was in reply to Peking's protest at the establishment of the Indian post at Khinzemane, beneath Thagla Ridge, and in it the Indian Government “requested] that the status quo should be maintained [at Khinzemane, the Longju area and the Tamaden area—where the Indians had also implemented unilateral modifications of the McMahon Line] and that the Chinese personnel should not alter the present position by crossing the Thagla ridge and trying to occupy any territory south of the ridge.” After another paragraph of general import, the Indian note went on: “Should the Chinese Government accept the proposal for a discussion of the exact delimitation of the border at the places mentioned above the Government of India would like to know what procedure they would wish to follow. 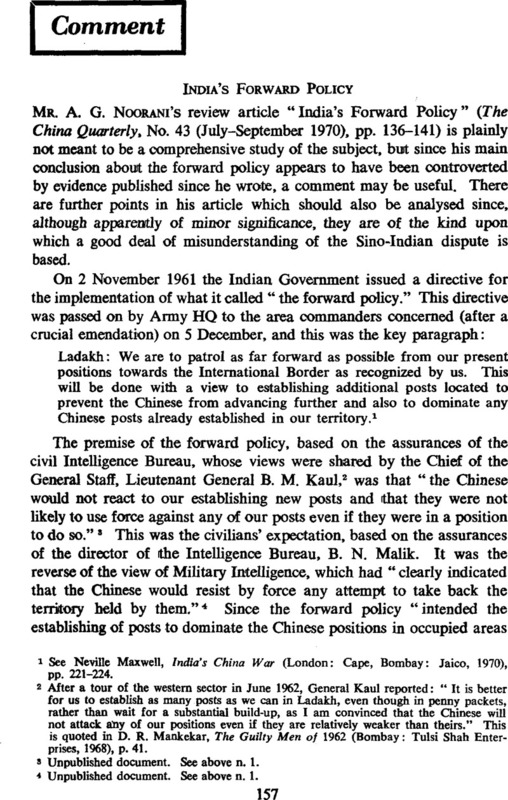 The Government of India agree pending further discussions the position as stated above should hot be altered by either side.” It can be argued that India here offered not a conditional undertaking, requiring only China's tacit observance (which was forthcoming—the Chinese did not cross Thagla Ridge until September 1962, three months after India had changed the status quo beneath it by establishing Dhola Post); but an offer seeking explicit acceptance. The point is a moot one; but the wording of the note is such that Peking can hardly be blamed if, as Chinese actions suggest, it was taken there as an Indian undertaking. 8 Indian White Paper, No. VII, pp. 3–4. 9 Prime Minister on Sino-lndian Relations: Vol. I: Indian Parliament: Part II, pp. 101–102. 10 Himalayan Blunder (Bombay: Thacker, 1969), p. 217.